Sam Warburton has been relieved of the Wales captaincy for the rest of the Six Nations to "focus on his own game". Warburton, 24, started the campaign as skipper and returns to the starting line-up after injury for Saturday's visit to Scotland. But Ryan Jones will continue to lead the side, and will retain the armband for the final game against England. 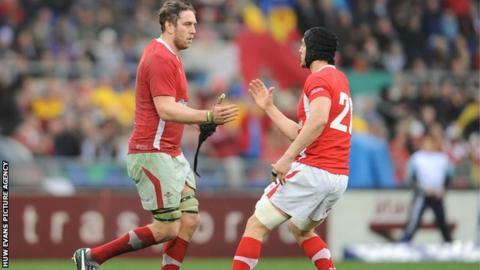 "We just want Sam to go out and concentrate and focus on his own game," said Wales interim coach Rob Howley. "He is a world class seven, he has proved that over the last 18 months. He is fantastic in the contact area and the breakdown, and we will certainly need that attribute against Scotland." Jones was completely overlooked for the Six Nations opener against Ireland as Wales lost 30-22 under Warburton's captaincy. But with Warburton out with a shoulder injury, blind-side flanker Jones was drafted in for the next match against France, and led the team to their first win in nine games and their first in Paris since 2005. Jones, 31, kept the role for Wales' 26-9 victory over Italy in Rome, where Warburton started on the replacements' bench and replaced his successor 12 minutes from time. Warburton has now been preferred to his replacement, Justin Tipuric, to face Scotland, but Howley feels the team will benefit from having Jones remain as captain at Murrayfield and for a potential title decider against England a week later. "I don't see any reason to change the dynamics," said Howley. "Ryan has been a great leader for the past two or three weeks. I have explained that situation to Sam, he is disappointed but it's about the team dynamics. "It's about how Ryan has led. Ryan, barring performance, will captain against England as well. "I spoke to Ryan before the French game, we know he can lead, we know he can motivate the team and he has shown that in abundance over the last couple of weeks. "The thing is Ryan has to perform as an international six, which he has done against France, has done against Italy and I am sure he will do exactly the same against Scotland."